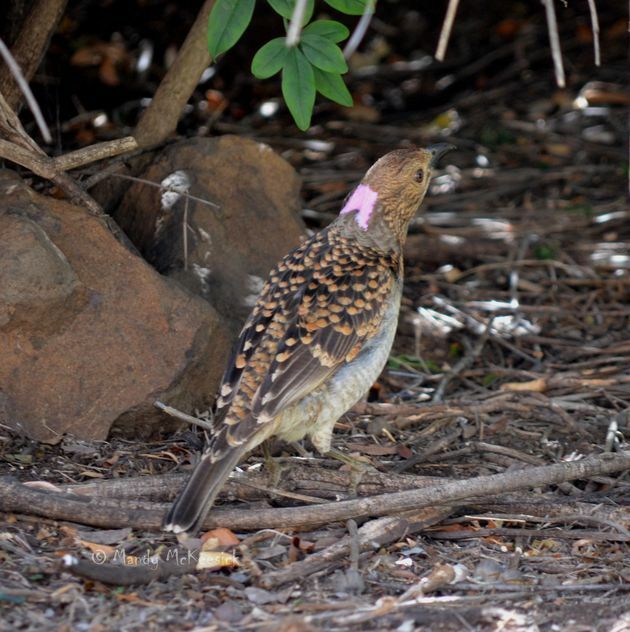 Last year you met our bowerbird (“He’ Back”), and admired his antics and his collection of bling. I told you he had thieved tomatoes, and bits of metal and a couple of nuts from the workshop; and we all thought this was cute. Well this year he has crossed the line. There are over 70 – that’s right seventy – galvanised nuts in there. Not many in our workshop but the bowerbird has 70. His stash is becoming a veritable hardware store. Want a split pin? Talk to the bird. How about a stainless steel shackle to fix that leaky trough? Talk to the bird. Maybe, a roofing screw? Talk to the bird. And the little blighter is still pinching my tomatoes. 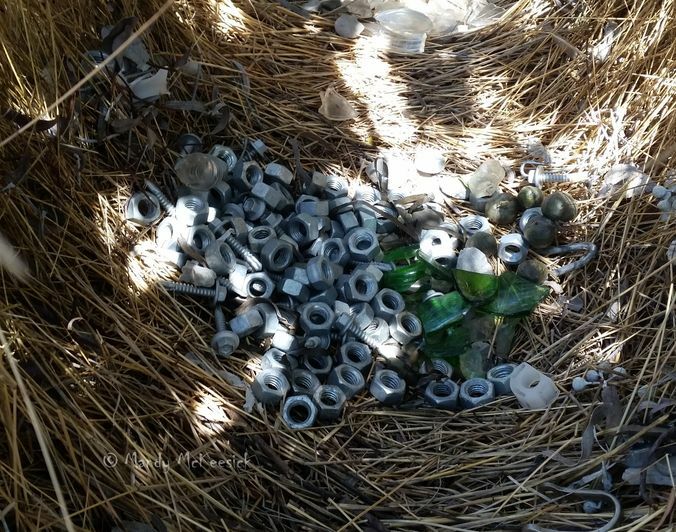 This entry was posted in Nature's Way and tagged bower, bowerbird, bowerbird bower, Spotted Bowerbird, theiving bowerbirds. Bookmark the permalink. Hi Mandy! that bird must be sending you people NUTS. Funny. You have made the assumption the bird is stealing your hardware but wouldn’t it be something if it was stealing the neighbours (though I suspect they may be too far away). Hahaha thats awesome 🙂 I have a spotted bower bird just started his bower not far from the house. Will be interesting to see what he collects. I have some photos of other bower birds that have awesome collections.They are all different in there preferences. Firstly – put a lock on your workshop. Secondly – I’d love to hear what your bowerbird adds to his collection, and would be interested in your photos of other bowers. Can you send me an email? Keep an eye out for the bower – and keep an eye on your hardware! 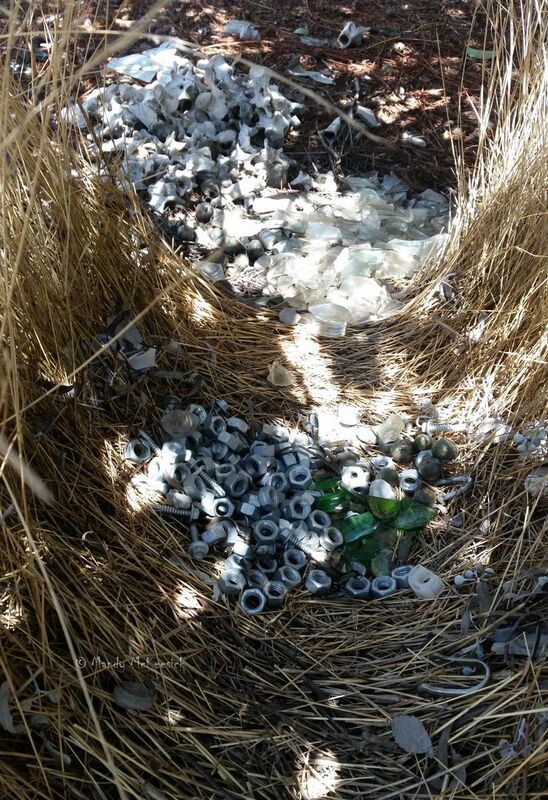 That is some pile that bird collected. Looks like he has a fetish for nuts. The most excitement we’ve had here in that department were field mice that got in the back of the old house (not too difficult) and stored hazelnuts in a pair of my boots. Yes he sure is a little darling. Today he is pinching metal staples from the workshop.